One of the most quoted statistics in my original article was the data point that 57% of Amazon’s book sales are in the Long Tail, defined as beyond the 100,000 books available in the typical Barnes and Noble superstore (we sometimes used 130,000, which is the inventory of its larger stores). We arrived at that number by working with the team at the MIT Sloan School that had produced one of the best economics papers on Amazon to date. Because Amazon, as a public company closely scrutinized by analysts looking for any hint of a forward-looking statement, does not reveal its sales figures, the MIT team had to attempt to reverse-engineer them from the information Amazon does provide, chiefly sales rank of individual titles. The forensic economics process they used, which had been tried by others at smaller scale, was to buy a set numbers of books at various ranks and see how those purchases changed the sales rank. Based on a sufficient number of these absolute-sales-to-relative-rank conversions, they were able to calculate a sales curve. In that curve, based on 2001-2003 data, 39.2% of sales fell above the 100,000 rank position. We updated that using 2004 sales data from Amazon, and came up with the 57% figure used in the story. Although all the other comparable data sets we had, such as Netflix and Rhapsody, showed Long Tail sales (sales of titles not carried by comparable bricks-and-mortar stores) in the 20%-25% range, the MIT methodology seemed solid and Amazon wasn't commenting one way or another. So we went with it. It was the best data available. After publication the number rightly raised eyebrows. First, it was well above what other retailers in the book market were experiencing. Second, we were told that Amazon’s sale rank algorithms were, well, notoriously funky; indeed, they apparently showed hysteresis at certain points, jumping backward thousands of rank steps when certain sales thresholds are crossed. Finally, Amazon sources suggested that the MIT methodology may have undercounted Head (top 100) sales, leading to an overcount of the Tail. Subsequently, I had the chance to speak with Jeff Bezos about the figure, and although he didn’t know the exact number, he also thought ours was very high. He guessed it was closer to the 20% range, in line with the other examples. In October, I posted on the debate here. For the book, it was clearly important to get this figure right, or at least righter. Amazon still isn’t releasing the hard numbers, but we do at least have a bit more experience at reverse-engineering them. A number of other academics have taken a stab at it since then, as well as some independent experts. I asked one of them, Morris Rosenthal of Foner Books, to extend the analysis he’s done over the past two years on correlating Amazon sales rank to absolute sales and apply that approach to the Long Tail. Fortunately, he took to the project with a vengeance and has built the beginning of what may be the best analytical framework for estimating Amazon’s sales yet. I’ll post his working methodology and conclusions here in hopes that others will help us improve it. Rosenthal and I are doing this because we recognize that this method, despite the work and experience that has gone into it, is still imperfect and its conclusions may be off base. So we’re looking for feedback and advice. Like the MIT team, Rosenthal works by buying books and watching how that changes rank. The difference is the Amazon has revamped its ranking methodology since last year, and we now have a few other datapoints to cross-check the conclusions with. I’ve shortened his explanation in the following, but the entire thing is in this file for those interested. The bottom line: his research with aggressive assumptions puts the Long Tail (titles beyond the top 100,000) at 36% of Amazon’s book sales. Conservative assumptions, meanwhile, put it under 20%. Cross-checking it against Amazon’re book revenues seems to suggest something in the mid-to-high twenties. In either case, it’s certainly less than 57% and even 39%. But the Long Tail still appears to be somewhere between a quarter and a third of Amazon’s book business, which is a significant fraction by any measure. The basic sales rate assumptions come from over 1,000 data points for a collection of books that I hand gathered last November to update my rank equivalency graph at www.fonerbooks.com/surfing.htm, some including artificial buys. Under the new system, two sales of any title, independent of whether it's ever sold before, will propel it into the top 50,000 books for a few hours. The exact rank and the length of time it stays there depends on the day of the week, the season, etc. The decay rate is fastest in the first 24 hours after the buys cease, dropping anywhere from 100,000 to 175,000 in the first 24 hours, again depending on day and season. This is a little tougher to determine than you might expect due to frequent and frustrating freezes in the overall ranking system. After the initial jolt, a bit of historical weight is introduced. A title that sells very rarely (never) will drop 100,000 the next day, 400,000 over the course of the week, another 200,000 the next week, 150,00 a week for a couple weeks after that. With no more known sales in the interim, it will stand around 2,000,000 today, eight months later. By the same token, for another infrequent seller, but one that had sold at least 20 copies through real and artificial buys in a couple years of Amazon life, the initial decay rate is about 75,000 in the first 24 hours, then 30,000 a day for a couple days, then 20,000 a day for a few weeks. When it gets to the range between 800,000 and 1,000,000, where it would have lived under the old system, the stability gets a little erratic and it may actually improve on a given day. However, as near as I can tell, it will continue slowly dropping every time a new title from further down the tail sells after it does, but the probability of that happening drops rapidly. 1) Amazon has sold approximately 2,000,000 unique titles in the last eight months. 2) Amazon sells somewhere between 150,000 and 200,000 unique titles on any give day. The top 30,000 titles average over 1 copy a day. 3) Of the top 100,000, we can estimate that 70,000 also only sell one copy that day. Based on a straight line log-log graph, I'd estimate that the 20,000 positions between 10,000 and 30,000 account for 28,000 sales. So we’re up to 98,000 sales on the body,vs. 100,000 on the long tail, with the top 10,000 to go. 4) The ranks between 1,000 and 10,000 are selling a couple copies a day, my latest graph estimated around 11 copies a day at the 1,000 rank. I regraphed it all the way from 10,000 to 1 on log-log with another straight line approximation. I arrive at 36,000 copies for the next 9,000 titles. That brings the body up to 134,000 vs. 100,000 for the long tail. 5) Finally, we have the top 1,000 books to deal with. These are books selling at least 11 copies a day. This time I extended the straight line out rather than setting the top title to 1,000 copies a day, and got the top at 2,100 copies a day, still an obvious underestimation. We get a little over 8,000 sales for the top 10 books, reading the trailing graph line. Between 10 and 100, we're talking about 90 titles ranging from 220 copies a day down to 50, or another 10,000 sales. The final bracket, from 100 to 1,000, sees sales ranging from over 50 a day down to 11 a day, or another 24,000, That gives us about 42,000 for the top 1000 books. 6) So, for a given day, the "body" sells 176,000 books, and the long tail 100,000, or about 36% for the long tail, using the 100,000 break point. 7) Now comes a checksum. 276,000 books a day equals 101 million books a year. Amazon's North American media sales on the year will be a little under $3.0 billion, and we can attribute about $2.0 billion of that to books based on the books-to-other-media ratio in this press release. Despite the huge importance of used sales to Amazon's bottom line, if I understood their annual reports, they only include the net from these sales in their North American sales number. If they do 25 million used book transactions (guesstimate, might be a little higher since books are more likely used items) and net a couple dollars per transaction (may be high given the number of Z-shops and auction sellers), it doesn't make a dent worth mentioning in the 2 billion of gross sales for books. If we declared the average selling price of a book on Amazon as $20, we could call it a perfect match and go home. My latest research shows top 100 titles average $15, but further out the curve they average $25 (but with a higher availability of cheap, used titles), so the $20 average selling price may not be a bad approximation. That said, it's a bit of a scary good match, so I'll have to go back and look at my methodology, make sure I'm not abusing the log-log technique or the like. Also keep in mind that the 200,000 unique titles a day is probably high, which increases the contribution of the long tail. Without inside information from Amazon, it's impossible to say for sure if the orphan book decay rate is really fixed by new titles selling past it. In the short term vs. mid term discussion, the 200,000 uniques a day is an important factor to look at, and I'll look at it some more. Even if Amazon does 200,000 uniques a day, but only 400,000 uniques a week and 500,000 a month, etc, the break point would keep books on the long tail that intuitively belong in the head for selling multiple copies a week. I took a further look at the time dependency after corresponding with Chris all weekend, and I realized that the current analysis will yield exactly the same Long Tail contribution whether we look at one day, two days, or a week. The controlling factor is where the slope of the rank/sales line changes on the log-log graph, which I did with straight line approximations. The true curve would of course be a curve, rather than a straight line, which would lead to a gradual drop in Long Tail contribution as the time period increased. By the time the sales rank # reaches 4,000,000, the curve needs to become asymptotic, a vertical line. Also, 36% is just the first estimate using the 100,000 break point. An identical analysis using the 130,000 break point from his original article gave a Long Tail contribution of 25%. Staying with the 100,000 break point, but adjusting my rank/sales chart for the fact the data was gathered in October/November (a slow season) brought the estimate down appreciably, and using 125,000 instead of 200,000 for the estimate of unique titles Amazon sells in a given day dropped it all the way to 12%. It seems to me that more data would generate more accuracy, and something like a customer survey would help a lot. Couldn't we set up a system where participants of the survey register their current Amazon book purchases? That would potentially generate a lot of data that can be cross-checked with the books' rankings and improve reliability of the data. It's an interesting idea, but the critical number for long tail analysis are the total number of unique titles sold by Amazon on a given day. That's not something that can be derived from a large data set, it's just a question of how you interpret Amazon rankings. It would also be great to know the exact number of books Amazon ships per year for the financial checksum, which is where the M.I.T. study Chris relies on doesn't make the cut. I think Rosenthal correctly mentions a real issue with his study when he says it is difficult to account for used book sales. IMHO, you are not studying the long tail if you do not account for this information. I don't think just because there is a glut of products and services that Long Tail companies offer that there is a glut of repetitive content (i.e, being sold new, but rather being re-sold used). Agree with John Z - Amazon is tremendously useful for out of print used books and that market should be part of the long tail for their business. 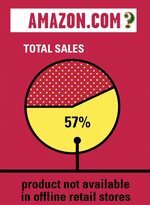 Surprisingly enough, the contribution from used book sales, while a large percentage of book item sales, is a very small percentage of sales dollars, because Amazon reports only the income they receive from the sellers. Even if Amazon was selling one used book for every two new books, the contribution to book revenues would be well less than 10% of the total reported. You could actually back out a reasonable estimate for the actual number of used books sold if you first established an average used book price through a fairly complex data collection job (you'd have to watch a lot of books to get prices for those that actually sold, rather than were simply offered). The sales rank curve doesn't require knowing how many used book are selling for calibration, as long as you use ebooks that or watch your test books like a hawk and adjust for used sales. Since they are included in the sales rank graph, used book sales are included in my Long Tail estimates by default. Where I don't account for them is in the checksum, but I believe all that really impacts is the average price part, which is itself a rough estimate. Yeah, so what? The point isn't what percentage of sales dollars resellers account for. The point is any break in Continuity and the continuous characteristic makes it harder to effectively study the Long Tail. In other words, the resellers are a far more mischeivous (sp?) data set than you would like to think; convenience in product continuity and continuously linked choices is Amazon.com's business model for selling books. To try and create a graph about Amazon.com's book selling without accounting for product continuity and continuously linked choices means your study is leaking a lot of information. You assume that sales rank is the most effective way to reverse engineer amazon's sales figures to get some good Long Tail data... I am not so sure about this. Amazon is a recommendation engine so its trivial to figure out what frequency of a statistical distribution a certain product falls into. What is important is how the filters of product X recommends the filters of product Y which leads to sales of either X or Y or both or sales of some "Omega product" that is nontrivial to X and Y because in some way the filters of X and Y contribute to the sales of product Omega without changing the sales of X or Y... You can then understand why Jeffrey Bezos would be secretive of sales information... so long as Amazon.com's knowledge management hides its sales information and marketing/promotion strategies they will have at least some form of competitive advantage. After a significant reduction in impact of the long tail, I don't see what the issue about long tail is. Long tail is nothing more than a huge mistake on your part, Chris. Long tail is a non-issue and doesn't really have much impact at all since you cannot build a growing business on it! Unlike my hand graphed curve, all of these academic economics studies used the Pareto function, and I don't see how it could have been applied to modeling the old Amazon ranking system. The Pareto function describes a nice continuous distributions, which the old ranking system wasn't. I believe they became enamored with using it because with a few data points or observations, they could produce a curve that agreed with their economics mindset. with ordering. There was a large discontinuity at 100,000 on the way down that was either caused by a third function being used for mid-region or by a change in time period for integration, which is how I tried to compensate for it. effect is so strong that you can closely approximate the field strength in any region by using only the dominant function, though boundaries are a bugger. The whole reason I got involved in estimating Amazon sales from ranks back five or six years ago was to give anxious authors and small publishers who checked their ranks on a regular basis some idea of actual sales. Long Tail assumptions and other economic analysis had nothing to do with it. Even today, the bulk of my correspondence on the subject is from authors who believe that their publisher is cheating them because they saw their sales rank go from 100,000 to 10,000 in a day and they think they must have sold a lot of books. Hmm, I value what you are saying and I understand your point about discontinuity and it might be valid that previous studies of Amazon were biased. I am not sure that was addressing my point though you definitely well-defended and explained some practical uses for your study. The real thing I think most people are interested in is the concealed impact of the Long Tail: does having a more content mean recommendations become more powerful? At least to a degree I am sure they do -- Touching the Void is an example of serious impact... but how big is this phenomenon? That's the real phenomenon of Chris Anderson's story in the Long tail, imho... forget the fact you have more choices. It's the social networks that exist between each choice that create otherwise nonexistent networks between products/people. Another issue I might mention is that certain books I have purchased through Amazon.com I have had to purchase through Amazon.co.uk INSTEAD only because Amazon.com does not "Stock" them but their UK site does -- a truly weird situation. An example of this is books by Charles Handy, in particular "The Empty Raincoat." David R - you miss the value of the tail - John "Z-Bo", you nail it! When the social value in selling slow-moving items outweighs the cost to do so, NOT selling he LT is a huge mistake - the challenge is keeping the cost down. I worked at Amazon from '01 to '04 and spent much of that time integrating vendors to drop-ship the tail direct to customers from their warehouses. Externalizing fulfillment is how a very long tail is most cost effectively managed - and as John says, its impact on future demand is cumulative. We've created a search engine to search products in Amazon's long tail. Our blog has the details. Have you seen the study "Thriving in a World of Consumer Control" by the Boston Consulting Group (available at http://www.bcg.com/publications/files/Thriving_in_a_World_of_Consumer_Control_June05_T&C.pdf)? They don't seem aware of the Long Tail yet but the article does have a lot of research & numbers that might bolster your media section. PS tell your publishers that this *IS* the way to prepare a book! I'm enjoying watching your progress. I too don't see what the issue about long tail is. How can a business be sustainable based on this model? Is Amazon an actual example because I don't think it is. Very good site. You are doing a great job. Please keep it up! It's very difficult competing with Amazon and we agree that they are very good at what they do. But we actually believe that we are better. Excellent article! Texas Holdem Poker Tips offer the most comprehensive tips and strategies to win at Texas Holdem.